Heavy rains set to impact same areas hit hard by Irene and Lee from today through Monday, A widespread 2-4 inches of rain is expected with pockets of 6+ inches. **Torrential rainfall and flash flooding has closed multiple roads in Frederick County, Md. at midday. Streams were out of their banks around Gettysburg, Pa. around lunchtime. Earlier in the day, the southern cities of Charlotte, N.C. and Columbia, S.C. were impacted by flash flooding. During the afternoon, Schuylkill County, Pa. was hit with torrential rain that closed and washed-out roadways. Don’t drive through flooded roadways. 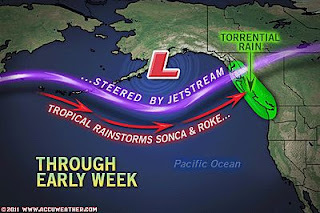 Because the low is ‘cut off’, meaning detached from the great transporter of weather systems (the jet stream), and has halted in the worst possible place along with it’s front, rain will not only fall in the worst impacted areas from the recent flooding, but it may last days rather than hours, sound familiar?. 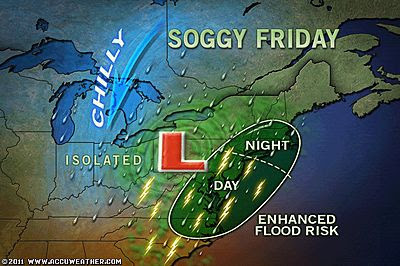 The front is situated to the west of the Eastern flood zone which got hammered by either Irene, Lee or both. This stalled low and front positioned where it is, means warm, moisture rich air flows up and across the flood zone in a ‘training’ fashion since there is little or no eastward progression of either the low nor the front and this means the moisture flow from both Gulf of Mexico and Atlantic continues to feed showers and thunderstorms up the East Coast throughout the weekend. The flooded areas from Virginia north through Delaware, Maryland, (including DC and Baltimore), New Jersey, Pennsylvania up through New England are all threatened by 3-6 inches of rain.. If there is one, the one silver lining in all this is the fact it’s a 3-6 inch rain event spread out over 2 to 3 days rather than 6 hours which would be far worse than what we saw with the tropical systems. 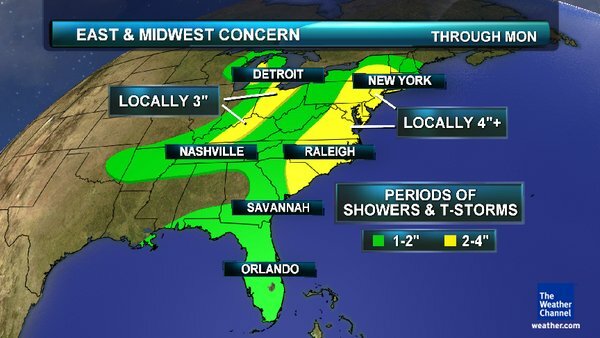 In the worst areas of flooding, only a mere 1-2 inches of rain is all that it will take for further flooding to occur. It’s most likely we will see more flooding but the question is how much, where and how bad. 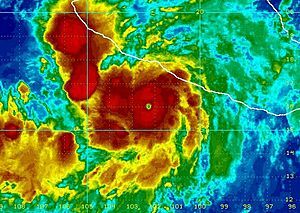 Hurricane Hilary in eastern Pacific and just off Mexican Riviera is tiny, but extremely powerful as a Category 4 storm. Downburst winds from severe thunderstorm in Greece on Tuesday causes extensive damage! This amazing video of a downbrust or tornado from a severe thunderstorm in Greece on Tuesday was brought to my attention from the WeatherMatrix, Jesse Ferrell! 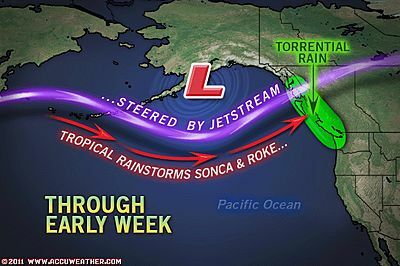 110 MPH Winds, 40-Foot Waves for Alaska and B.C.